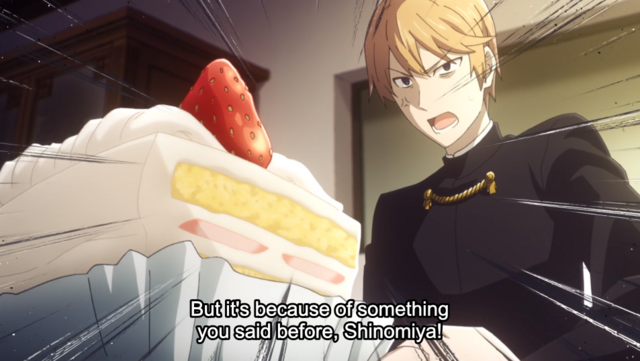 Strawberry Shortcake from Kaguya-Sama: Love is War! Read the original post here, or see below. Strawberry shortcake is one of my fantasy foods. By that, I mean that I have it in my head what a perfect strawberry shortcake should LOOK like. I have it in my head what a perfect strawberry shortcake should TASTE like. The problem is that I can rarely reconcile those two in my head. I can get the right LOOK down, but it’s the taste, the texture, the crumb of the cake that evades me. I’m never quite as satisfied as I want to be. 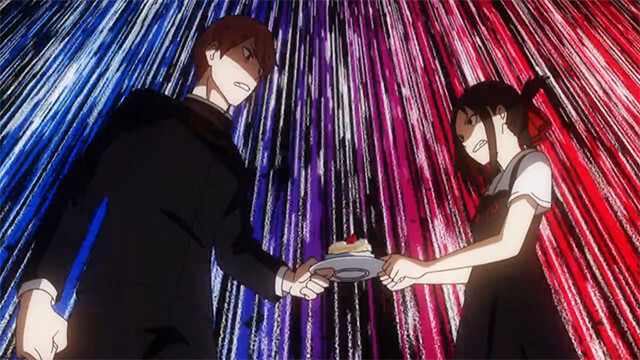 So, when I saw them bandying the cake around in the newest episode of Kaguya-sama: Love is War, I couldn’t help myself. That desire rose up in me again, and I HAD to give it just one more try! I’ve made and published a few iterations of the typical Japanese strawberry shortcake- ones with sponge cake bases. But I think I’ve never really been able to get around the sponge cake texture- though it’s traditional, it’s too dry for me, too airy. I decided to try something new—a more of a firm butter cake base, with cream cheese—whipped cream frosting, instead of the usual straight whipped cream. I figured the butter base would make for a denser, more flavorful cake, and adding the cream cheese to the frosting would provide a welcome tang to disrupt the overall sweetness. This means that a few things change in the construction. We start with dry ingredients and add in the wet, little by little. This cuts down significantly on prep time because we don’t have to whip egg whites together and fold them into the batter. The cake bakes for a solid hour or so until golden brown ALL over. The cream cheese frosting is uncomplicated; you whip the cream, whip the cream cheese, sugar, vanilla, and salt, and then fold the two together. Double the recipe just to be TOTALLY sure you won’t run out of frosting (which is my number one pet peeve when it comes to cake decorating). The assembly is a cinch, as long as you make sure the cake is COMPLETELY cooled, and you’ve got everything ready to go. Kaguya and Shirogane never got to eat the cake themselves, but I’ll speak for them when I say that my recipe is delicious. It is absolutely delightful—moist and rich cake, punctuated by bursts of bright strawberry and tangy cream cheese. I’m still not 100% happy with it—it is maybe a little dense for my taste—but it is definitely a personal improvement on what I’ve made before. 1. Line the bottom of an 8-inch cake pan with baking paper. Grease with butter leftover on butter wrappers. Set aside. Preheat oven to 350 F.
2. Whisk all dry ingredients together: flours, sugar, salt, baking powder. Then, in a stand mixer, add in the butter and mix on low until it is incorporated into the dry mixture- it should appear sandy. 3. Then, add in eggs two at a time, mixing well after each addition. Then, add in milk a little at a time, until just mixed together. Then, spoon the whole mixture into the 8-inch pan, tapping down to release any air bubbles. Bake about 1 hour, or until caramelized and deeply golden brown all over. The cake should be pulling away from the pan when it is finished. A tester inserted into the middle should come out clean. Allow to cool on a wire rack until it is no longer even WARM. Seriously. I cool mine in the freezer to cut back on time. 4. While waiting for it to cool, prep frosting. Whip cream until stiff peaks form. Set aside. With the same beaters, whip the cream cheese, sugar, salt, and vanilla together. Whip about three minutes until it gets nice and aerated. Then, fold the cream cheese mixture into the whipped cream until evenly mixed together. Prep the strawberries. Select five or more for the top. Then, slice the rest into even pieces for the filling. Zest the lemon for the filling. 5. When cake is cooled, take the top domed edge off. Split in half, and then remove caramelization on the sides. Assemble and frost according to the video’s instructions, and enjoy fresh! Next Post April Fool’s Onigiri inspired by Food Wars!